Herbert Montgomery Martin records many crashes. The aerodrome was home to Training Squadrons from May 1916 until the end and beyond of the war; No. 17 Training Squadron in May 1916, then No. 40 Training Squadron from 1 June 1916 until 14 December 1918. A great example is this one of Lt. Neisding, showing a Sopwith Camel in trees, in Beddington in January 1918. You can see the ladder in place to rescue the pilot. The index to the photographs does not give the service numbers of the men pictured and the spelling of their names seems to be occasionally inaccurate. It is, therefore, difficult to ascertain if the records I have tracked down are exactly the men pictured. However, Cadet Hackett is likely to be D Hackett (No.139633) pictured here in a crash of an Avro 504 JK (D4490). Sometimes the ground crew are shown trying to rescue the pilot and the plane as in this one below of an upturned Sopwith Pup. Some of the pilots pictured by Martin, inevitably, went on to lose their lives in battle and accidents. Lt. Arthur Percy Jones crashed this Sopwith Pup and survived. He had been in the Royal Fusiliers (5685) and then the RFC (138709). He was not so lucky in September 1918 when he crashed the Sopwith Camel he was flying and was fatally wounded. 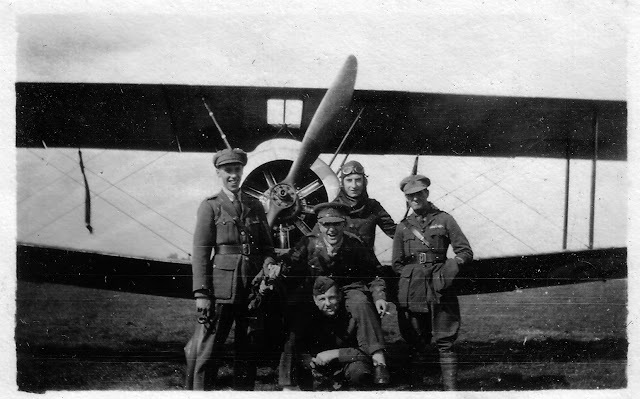 2nd Lt Duncan Lane Donaldson, pictured in the centre of this photograph was a South African from Joannesburg and relatively old for a pilot at 28 years old when he died. The Sopwith Camel he was flying crashed down the road at Purley on 8 October 1918. The cause seemed to have been engine failure. Sgt. William Boyd Jardine features in many of Martin’s photographs, including this one of his crashed Avro with interested spectators investigating it. There is another of him at camp. 131 and another at the RAF Sports Day held at Beddington / Croydon Aerodrome in August 1918 (below). Tragically Jardine crashed in a Sopwith Camel near the aerodrome, after the war had ended, on 26 November 1918.